Shell consists of Drum Chamber and Steam Jacket with Outer Cover. The Drum Chamber and Steam Jacket are made of thick SS 304 Grade Sheet. The Whole Shell is mounted on a sturdy M.S. tubular Stand. Boiler fitted under the shell to generate steam and maintain the Steam Pressure in the Steam Jacket and Drum Chamber through Stainless Steel Pipeline fitted with Stainless Steel Sockets. Boiler fitted with Auto Pressure Control Device to set and maintain the Drum Chamber pressure by maintaining electric supply to heater. It also economizes the power consumption. Door is made of thick stainless steel Plate. Door has a safety mechanism which automatically locks when Drum Chamber is having pressure. This prevents opening of door during operation to avoid any eventuality of accident. Sterilization Cycle is controlled by Stainless Steel Three way valve or multi port valve. Auto Pressure Control device (auto cut off safety device for overheating) to maintain the required pressure. 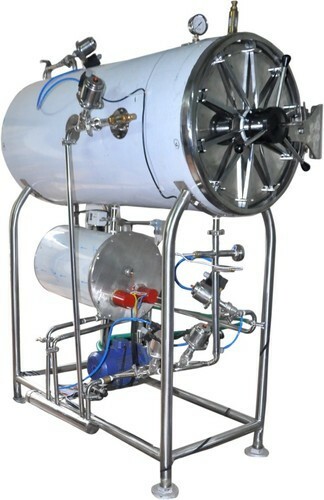 Automatic Vacuum Valve fitted with Drum Chamber for regular exhaust of vacuum. One hour timer switch adjustable for any required time for sterilization and after that period this will disconnect the heaters. Alarm switch for the indication of pressure. Automatic Low Water Level Cut off device for heater safety. Water level indicator & Safety valve fitted with boiler. Steam Jacket Pressure Gauge and Safety Valve fitted on the Top Front of the Autoclave. Drum Chamber Pressure Gauge and Safety Valve fitted on the Top Front of the Autoclave. Water inlet & Outlet valve. Boiler Auto Pressure Control Device.